Thanks to the importers Haus Alpenz we have the ability to purchase two of my favorite aperitif wines, Cocchi Americano and Bonal Gentiane Quina in the States. 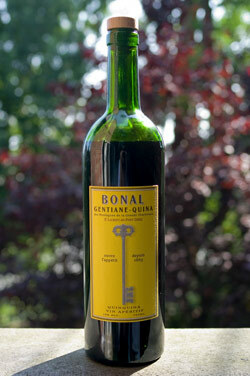 But today we focus on Bonal Gentiane Quina, a French aperitif wine that has been in production since 1865. This aperitif wine is know in France as “ouvre l’appétit” or the key to the appetite. This is fitting since the word aperitif derives from the Latin aperire, which is the verb “to open”, relating to opening up one’s appetite. All aperitifs utilize a bittersweet character that stimulates the production of the gastric juices and promotes appetite. Bonal Gentiane Quina has a reddish brown color and an upfront smell of prunes or raisins. Upon sipping I first noticed flavors of raisins/grapes. The mid-palette contains the bitter elements from the gentian root and cinchona. It finishes sweet with grapes and hints of cherry and licorice. I can see Bonal going very well with brown spirits, especially brandy and cognacs to make a perfect stirred cocktail to start your night off proper. 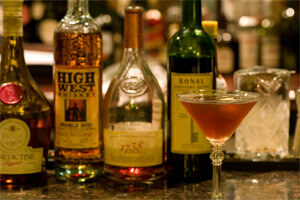 Most recipes that use sweet vermouth can be swapped out with Bonal. We recently acquired an original 1934 Bonal Aperitif Gentiane-Quina vintage print, which led me to do some research on this liquor, and hence your site. Thanks for the info and keep up the good work!